Aleph Bet Room Border in both block and script from EKS Publishing. 12" tall in bright colors, it is a great visual aid to teach the alef bet. Letters are 3" tall to ensure visibility. 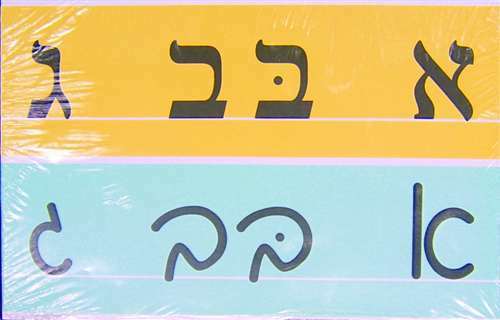 The nine, 19" sections will go around the classroom, surrounding the students with Hebrew. Fine for the home, too! Bright Borders - Tons of Teddies - 12 pack - 3 ft. x 2.25 in. Children's Map of Israel in English 38"